Plaster-impregnated gauze that comes in a convenient 5 lb. fan-folded package. 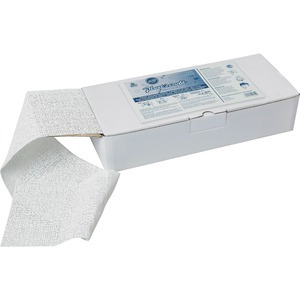 The gauze band is 6" wide, and the continuous fan-fold packing allows easy use and handling. Simply cut to desired lengths, wet strips and mold around a base shape. Plast'r Craft adheres to itself or any porous material. After it dries, sand smooth and paint. Instructions are included.